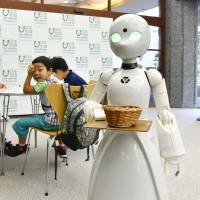 A temporary cafe that will use remotely controlled robots as waiters is set to open in Tokyo’s Akasaka district in November to show how machines can act as proxies for people with severe physical disabilities. The cafe, which will be open on weekdays between Nov. 26 and Dec. 7, will make use of robots controlled by people with diseases like amyotrophic lateral sclerosis, a motor neuron disease also known as Lou Gehrig’s disease. The 1.2-meter robots, which weigh 20 kg, will transmit video and audio over the internet so they can be directed from home through tablet and personal computers. “I want to create a world in which people who can’t move their bodies can work too,” said Kentaro Yoshifuji, CEO of Ory Lab. Inc., which developed the OriHime-D robots to be used by the cafe. During their debut, a robot controlled by Nozomi Murata, who has auto-phagic vacuolar myopathy, a debilitating disease that weakens the muscles, invited a family to try some chocolate. Due to a stress-induced illness during childhood, Yoshifuji had difficulty communicating. In light of his social isolation, he started developing robots at Waseda University to help connect people, Ory Lab’s website says. Smaller OriHime robots 21.5 cm tall and weighing just 600 grams have been adopted by about 70 firms for telecommuting. They can also be used remotely in classrooms by students who cannot attend due to illness or other reasons. Ory Lab. 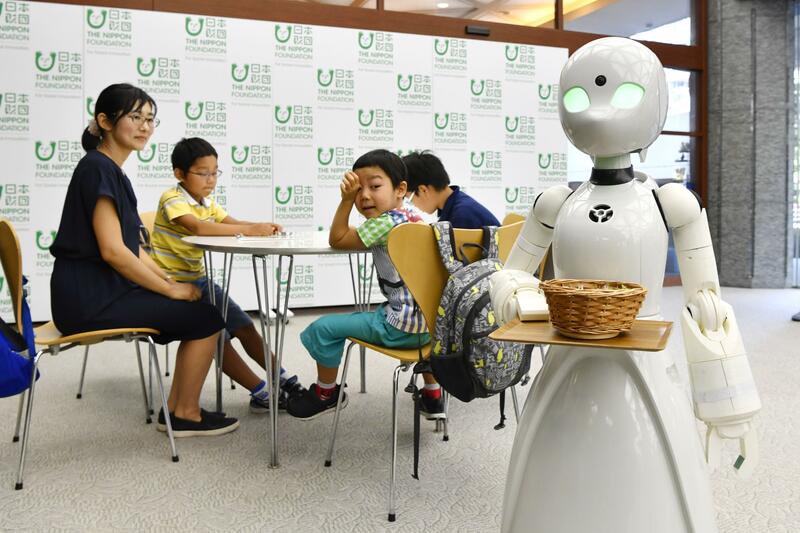 aims to set up a permanent cafe featuring its robots and promote their adoption by firms in the run-up to the 2020 Tokyo Olympics and Paralympics. “Everyone should have the freedom to work in the way they like,” said Masatane Muto, an ALS patient organizing the project. “I want to send out the message toward 2020 that you can show hospitality even if you have disabilities,” Muto said.